The spectator selects any playing card and number, and will find their card at the selected position in the deck. 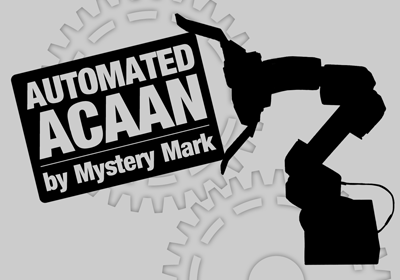 Mystery Mark's 'Automated ACAAN' is a completely self-working take on the 'Any Card At Any Number' plot and takes fully place in the spectator's hands. Once prepared, it is instantly performable and repeatable. On top of that, you will get to learn some variations, as well as some uncommon sleights you can use along with other card tricks. Both the card and number are selected using the deck with any of the included 'ACAAN cards'. Also, be aware that the 'Automated ACAAN' is a unique combination of principles that have been used by magicians for decades. Because of that, it may not be a magicians fooler, but is very workable and solid on laymen nonetheless. Some of the additional principles can actually be used to fool magicians as well for that these are very rare and have been overlooked by most. A full deck of playing cards. Cut forces, full deck false shuffles and other techniques and principles you will be able to use in any of your other card magic. Copyright ©2012 DarkSleightZ - It's eS productions. All Rights Reserved. Because of the cards (which should not be misunderstood with a deck of playing cards because it isn't). As mentioned, these make the effect possible. How is this impromptu if it requires special cards??? It is impromptu because you can perform it anywhere at anytime and it is instantly repeatable. All you have to do is carry an 'Automated ACAAN' card along with your deck and you are all set. Or you do the taught version that you can perform with any truly shuffled deck of cards as these don't need anything but a deck of cards. Mark, what do you consider as "impromptu"? I have seen before that this is kind of different according to each magician. For example, you said in one of your videos that one should always carry around a different coloured card, so therefore it is impromptu. This looks great, and the demo Mark gave me backs that up! There are three definitions of impromptu really, the literal way as mentioned in the dictionary, the term as used in 'impromptu magic', and the term as a marketing term. The first is the most flexible, the last is the most solid, for obvious reasons. "Made, done, or formed on or as if on the spur of the moment." So if someone tells you to show them a trick and you perform any, even if it requires a special prop you just happen to have on you at that moment, this would be considered impromptu. If you take a coin, put this in your fist and ask people what they want to see happen, and they will say "Make it vanish", you making the coin disappear would be impromptu too. This is magic that can be done anywhere at anytime, with the props available at the situation. If you perform at a party where there happen to be balloons, and you decide to perform what is known as 'Pressure' nowadays, that is considered to be impromptu magic. Same with a coin through glass effect done with borrowed items. This is the most solid definition for that people have to understand its definition when buying anything. As posted by Admin, it is any effect that can be performed anywhere at anytime and which is instantly repeatable. A good example of this is the 'Invisible Deck', which by all means is considered to be impromptu (just not clean). Any set-up deck trick in which the setup is not ruined is considered to be impromptu as well. A gimmicked or gaffed card that you carry along in your deck at all times is too. And so is the 'Automated ACAAN'. As you can see, there is not all that much to it and all of the meanings have huge overlaps. Any company that twists the definition to use it merely to make their tricks look more attractive than they really are, and who says the definition is actually something personal, is terribly wrong. It is for that, that theory11 had to remove the statement of that 'GPS' by Chris Kenner is impromptu. Then again, the latter way is merely required for marketing anything. You can use the term as loosely as in the literal meaning of the word, but almost every effect could be performed in an impromptu manner and thus be called as such. For that, it would be irresponsible for companies to use it that way. @@#&%$#! I feel so bad about leaving this site for such a long time, but now I'm back, and its better than ever! You guys are great, new store design, more practical magic coming out by the minute! Man, this is so great!!! 'Confusion' was discussed in 'Instantaneous' and will be in an upcoming Mystery Session along with another kind of effect as well. As for 'Jewel-cased', we have too many products planned before that one to say whether it will ever be released. Some of the other previously listed effects will be in Mystery Session too, or else come out whenever all of the DVDs and Sessions have been produced. Oh yeah, I remember Confusion. The wording kind of threw me off. One more question, purely out of curiosity: Is one of the false shuffles on the Automated ACAAN DVD the one you showed me on Skype, or similar to it? Because if they're all as awesome as that then..... damn. No idea which I showed you, but they are likely just as awesome as I use each one of them. thank you fro these definitions, know I know impromptu and clean are the best combination! Have you put the tutorial video on itestore ? The instructional video will be available one of these days. It should be on there before or at the moment the package is received by the first people. Don't worry, no stack memorization is needed at all. We have just included that stack for those who use it and wish to do the 'Automated ACAAN' with it as well.